1. Universities from EU Member States - University of Zagreb, University of Maribor and Higher School of Social Technologies in Riga. These Universities have particular experience in adopting of their national legal systems and state structure to International and EU legal rules, their application and management. European universities cover the EU from its south (Croatia, Slovenia) to its north (Latvia). Slovenian and Croatian institutions are classical universities with long-standing academic traditions, whereas Higher School of Social Technologies in Riga has been set up more recently being oriented on interdisciplinary research. 2. Ukraine was represented by three universities: Donetsk National University, National University "Odessa Law Academy" and Taurida National V.I. Vernadsky University. These institutions are the main educational and scientific centers of the country. They are successfully geographically located in different regions of Ukraine. This advantage will equally involve all students wishing to study for a double degree within the framework of the proposed project. 3. The consortium of Russian institutions was selected taking into account two paramount criteria: to match the need analysis and Russian geography. The Russia was thus represented by Kazan (Volga region) Federal University, Voronezh State University and Tyumen State University. Eventually some of the consortium members withdrew from the project. Considering political situation in Simferopol, Taurida National V.I. Vernadsky University was suspended by EACEA on November 3, 2014 and officialy withdrew on May 5, 2015. It's no longer a part of the project. Higher School of Social Technologies in Riga stopped participating actively in December 2015. Even though it never formally withdrew from the project, EACEA was notified about that circumstance. The project was successfully finished on May 31, 2017 by seven-member consortium consisted of: University of Zagreb, University of Maribor, Vasyl' Stus Donetsk National University in Vinnytsa, National University "Odessa Law Academy", Kazan (Volga region) Federal University, Voronezh State University and Tyumen State University. University of Zagreb is the biggest and the oldest university in Croatia. It was founded in 1669. Faculty of Economics and Business is one of its key parts and it is devoted to teaching and scientific research in the area of economics and business as well as in adjoin disciplines such as law, mathematics, statistics. The Faculty's Department of Law consists of 3 professors and 5 teaching and researching assistants. The head of the Department Professor Hana Horak is a Jean Monnet Chair holder. Members of the Department have special interests in European Law issues and teach several courses that deal with European issues in Croatian and as well in English. The European courses are: European Market Law, Economic analysis of the European Law, European Company Law, Competition Law and European Contract Law.Furthermore the Department has modelled specialization masters programme in Legal and Economic Aspects of Doing Business in the EU, a one year course for economists, lawyers and others. University of Maribor, Faculty of Law is the second largest university (as well as faculty of law) in Slovenia. The Faculty of Law is deeply involved in the teaching of EU law as well as in the area of research activities in this field. It holds Jean Monnet Chair in European Legal Studies, as well as several different EU teaching modules. It started to educate EU law and connected fields of law already in 1989, years before Slovenia join the EU and therefore the faculty holds a rather important experiences in the field of EU integration processes. Donetsk National University (DNU) is a leading Ukrainian university in innovating new educational ideas and importing European Quality Assurance procedures into its structure. The university has more than 20 000 students and provides education in the natural sciences, humanitarian and economic fields. It employs 32 Academicians of the National Academy of Science of Ukraine and more than 250 professors and doctors of science. It has close relations with 26 universities around the world. It is a member of the European Universities Association as well as two international organizations (EURASIA and AIMOS) In 2004, it was one of the first to sign the Magna Charta of European Universities. Over the past three years, DNU has been leading the way in Reach Out and this project is an opportunity to consolidate many of its ideas. DNU is committed to Life long learning and sees this as the future of Education across the world. It is stated in its mission. DNU was relocated from Donetsk to Vynnitsa on February 24, 2015. On the October 4, 2016 Donetsk National University was renamed to Vasyl' Stus Donetsk National University. Regardless of all the changes it faced it remained the active partner until the end of the project. 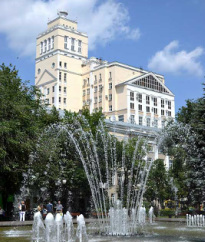 NU “OLA” is a leading center of legal education, culture and science in Ukraine. The main activity purposes are ensuring conditions required for persons in order to obtain higher education and scientific research in legal and political spheres. The University includes 3 institutes, 18 faculties, Master Program in Civil Service. The training is implemented by 51 departments, with highly qualified specialists including more than 410 doctors, PhDs, professors and associate professors. 17000 students are getting education on specialties – Law, Journalism, Political Science, Sociology, Public Administration, Intellectual Property preparing to work in public authorities, international organizations, and business sphere. NU “OLA” is the only one in Ukraine, where students have possibility to study legal disciplines in 5 languages: Ukrainian, Russian, English, German and French. On base of the University there is also PhD program in Law and Political Science. Kazan (Volga region) Federal University is one of the oldest classical universities of Russia. It was founded in 1804. The structure of KFU academic departments includes 18 research institutes and faculties, 243 departments and 40 laboratories. More than 35,000 students study at KFU. KFU collaborates with 18 foreign partner universities and a number of research institutes of the world. About 600 foreign graduate and post-graduate students study at KFU. It participated in a number of education and research projects of European and American programs. At present KFU is reforming its academic structure bringing it in conformity with the "Bologna process" and developing international relations to provide new master programs meeting the requirements of the modern society. 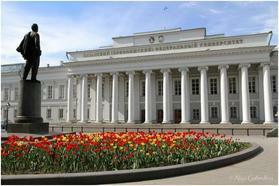 Voronezh State University (VSU) is one of the leading classical universities of Russia. It was founded in 1918. The structure of VSU academic departments includes 17 faculties, 5 research institutes, 14 joint laboratories with the Russian Academy of Sciences. About 21,000 students study at VSU. VSU collaborates with 68 foreign universities and research institutes of the world. It participated in a number of education and research projects of European and American programmes including 7 TEMPUS/TACIS projects (since 1994). At present VSU is actively modernising its academic models in line with the principles of the "Bologna process". More than 1 000 foreign graduate and post-graduate students study at VSU. The Faculty of Law was established in 1958 and is comprised of 11 departments, a resource centre and a forensics laboratory. The faculty currently enrolls 4,000 students. The academic staff of the faculty is comprised 21 professors and over 70 PhDs (Candidates of Law). Tyumen State University (TSU) is one of the leading classical universities in the West Siberia of Russia. It was founded in 1918 as the Pedagogical institute first and reorganized as the University in 1973. The structure of TSU includes 8 edicational institutes and 14 educatiobal branches, 5 research institutes, 13 research-and-educational centres, 26 research laboratories, 11 limited companies. About 30,000 students study at TSU. The University collaborates with 64 foreign universities. It participates in a number of education and research European programs including TEMPUS/TACIS projects. TSU has mostly reconstructed its academic services in accordance with the "Bologna process". About 1 400 foreign graduate and post-graduate students study at ТSU. The former Faculty of Law (now the Institute of Law, Economics and Management) was established in 1985. Currently it has 8 law departments (chairs) and enrolls 1 586 law students.